This is a triangular shawl, with a [yarnover, knit, yarnover] double increase down the center and an increase on both edges. I'm knitting it with a thin yarn on largish needles to enhance the laciness but I'm sure many readers will want to try different sizes of yarn and needles so that's how I'm writing the instructions. The shawl consists of 4 patterns, the Soaring Birds, the Ears of Wheat, the Climbing Leaves, and the Waves of Water. 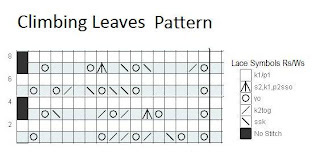 I've charted the patterns and will start you off with written out instructions but then refer you to the charts to continue for the specified amount. I've decided that triangle shawls are the most flattering to most women, but they need to be big enough. I've seen many patterns that have the long side measure 7 feet. That uses a lot of yarn and you need pretty big needles to keep it all on! I highly recommend using circular needles. C** SL2,K1,P2SSO = slip 2 like for the K2tog, knit the next stitch, then pass the two slipped stitches over the one you just knit, for a centered double decrease. This is used on the Ears of Wheat and the Climbing Leaves. SK2P - slip 1, knit 2 together as one, pass the slipped stitch over for a left-leaning decrease. This is used on the Soaring Birds and the Waves of Water. To begin, cast on 3. Row 23: start second row of "birds" following the chart. Notice there will always be two knit stitches at the beginning and end of the rows, and 5 knit stitches between the "birds". Continue until this section measures 12 inches measured in the direction indicated. You can click on the chart to see it bigger. 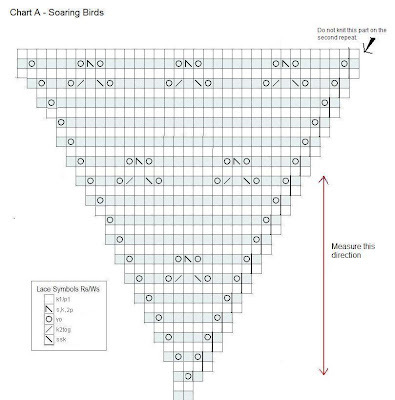 The chart shows one of the two repeats so remember you need to do it twice. AFTER CENTER: knit the mirror of the other side to resume (K2; K2tog, O, K; O, SSK, K) repeat to end, O, K (this should come out even at the end of the row). Row 1: P3, (K, P7) to center...(P7, K), purl last 3 stitches. Row 3: P4, (K, P7) to center... (P7, K), purl last 4 stitches. Row 5: P5, (K, P7) to center... (P7, K), purl last 5 stitches. Row 7: P6, (K, P7) to center... (P7, K), purl last 6 stitches. Row 9: P7, (K, P7) to center... (P7, K), purl last 7 stitches. Row 11: P8, (K, P7) to center... (P7, K), purl last 8 stitches. The Ears of Wheat section needs to be at least 6 inches. If you are using lace weight yarn and small needles it may not, so continue the pattern until it does. It's ok to make it more than 6 inches but you'll need more yarn then. If you are using larger yarn you may find it will become very large; in that case you can leave out a couple rows in the center of each "Ear of Wheat" - where the rows are identical except for the edge where you increase it. This pattern is really just two rows of knit pattern then the reverse of them. From here on out all rows on the wrong side are just purled. When you get to the center increase, you'll knit the reverse row on the other half, which is the second row above or below the one you just knit from the chart. I'll write out the first four rows you'll knit, showing the edge stitches I used for the edge increases. If you shortened the Ears of Wheat or added rows it probably won't match mine. 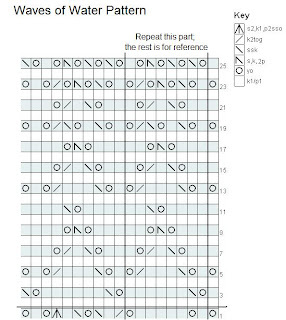 To begin this pattern, you pick the nearest O, K, O from the row you last knit and line it up with the column of O, K, O's from the charted pattern. 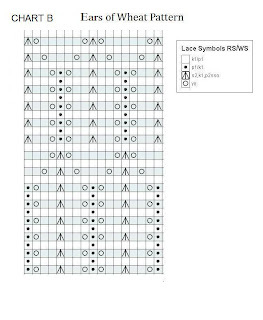 You'll have to count backwards to see how many stitches of the pattern you can do, using the semicolons in the written instructions if needed to see where the increases and decreases balance out. An easier way, if you prefer, is you can just knit any extra stitches at the beginning, end, and center, not trying to break the pattern and figure out where to start. Regardless, as above, just knit any remaining stitches from the edges to the pattern and in the center before and after the center increase. And remember if the pattern comes out exactly at the center increase, use the knit, yarnover, knit in the center stitch to continue increasing there. As you may notice, this pattern has a wonky stitch count - every other pair of rows has an extra stitch. Continue the Climbing Leaves pattern for at least 6 inches, but longer for a larger shawl. The first row is the hardest but after that it's really easy to remember. You need to end this on one of the rows that has the C**/S2KP2 double decrease, so if that wasn't your last row, knit one more. There is no transition to the Waves of Water pattern, just center one of the yarnovers on the first row over the knit stitch in one of the O, K, O columns (not the stem). Make sure the edges and center of the shawl are still being increased. You don't need to reverse this pattern on the other side of the center increase, just be sure it has the same number of "extra" stitches on both sides. I put the last Ears of Wheat row in there for reference, but yours may be the other row that has the double decrease (which would be on the other side of the center). When I bound off I used larger needles but it was still too tight. One way you may be able to prevent this is to knit one last row of just alternating knit, yarnover then purl then bind off. If you had extra edge you could block it to come to points for a more scalloped edge, which would be attractive. Wow! Just lovely. Going into my Rav favorites right NOW! What a beautiful shawl! Thank you for sharing it with us. what do you consider largest needles? Size 19, 35, 50's? What size are you using? Thanks. For the acrylic version (sport weight) I used size 10 US needles. For the lace weight version I used size 8 US needles. You probably want to use bigger than what the yarn package recommends by 1-2 sizes to make it lacey.